Mr. Ameer Ahamed is the Chairman of the Manappat Group, which operates in 5 countries across three continents. Mr. Ameer chairs the Boards of all of the Group’s companies in India and abroad. Its clutch of global companies features Advanced Innovative Engineering (UK) Ltd. in UK, Teejan General Trading LLC. (Dubai), Agnice International Partners LLC. (Oman), Agnice Contracting LLC & Agnice Electromechanical LLC (Dubai). In India, he chairs the Boards of Agnice Fire Protection Pvt. Ltd., Manappat Infratech Pvt. Ltd. & Connect Plus Pvt. Ltd. The Group’s businesses are spread across a diverse portfolio of industries. These include civil contracting, electromechanical contracting, fire engineering solutions, manufacturing, retail, trading & hospitality. Mr. Ameer took over as Chairman & Managing Director of the Group in 1999, at the age of 45. As Chairman, Mr. Ameer has taken the Manappat Group to a higher growth trajectory. In the 30 years that he has been at the helm of the Group, he created an enviable brand for the group through an accelerated growth and enhanced stakeholder value. Mr. Ameer has restructured the businesses to emerge as a global/national leader in the sectors in which the Group operates and has a total of 2500 employees belonging to diverse nationalities. Mr. Ameer holds several key positions in the society on various regulatory and professional Boards. He is the Director of Sahulat Microfinance Society in New Delhi and also of various trusts and higher power committees within the county and also in countries like Sultanate of Oman. He is also a Court member of Aligarh Muslim University and who are our partners in furtherance of our Manappat Foundation Vision 2040. He has also been conferred with the most outstanding entrepreneur award by Kerala State Industrial Development Corporation in 2011. A firm practitioner of the trusteeship concept, Mr. Ameer has institutionalized the concept of caring and giving at the Manappat Group. With his mandate, the Group is involved in meaningful welfare driven activities that distinctively impact the quality of life of the weaker sections of society. In India, the Group is engaged in reaching out to people and making a difference to their lives through meticulously conceived projects focusing on health care, education, sustainable livelihood, infrastructure and social causes. For instance, the Group runs few schools which provide quality education to children. Of these, numerous children receive free education. Additionally, a number of youngsters benefit from Bridge educational programmes and other vocational training. In line with its commitment to sustainable development, the Group has partnered with the ‘Centre for Promotion of Educational and Cultural Advancement of Muslims of India’ (CEPECAMI), Aligarh Muslim University and has a Memorandum of Understanding (MoU) with the Manappat Foundation (MF) for implementing the ‘Vision 2040’ Project aimed for upliftment of marginalized sections of the society and make them self-reliant by imparting training, education and self-employment opportunities. A Political Science Graduate, Mr. Ameer earned an MBA Degree from the Aligarh Muslim University in 1978. Born September 22, 1953, in Kalpakanchery, Kerala, India, Mr. Ameer was raised in Kerala. Mr. Ameer and his wife, Mrs. Anitha Ameer, have three children, Suhail Ameer, Fathma Manappat and Aasim Ameer. 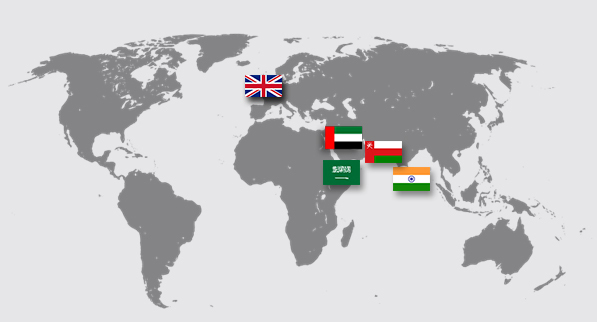 The Manappat Group is a vibrant, versatile business house with an unrivalled portfolio of interests and investments across the Sultanate of Oman, United Arab Emirates, India and Saudi Arabia.